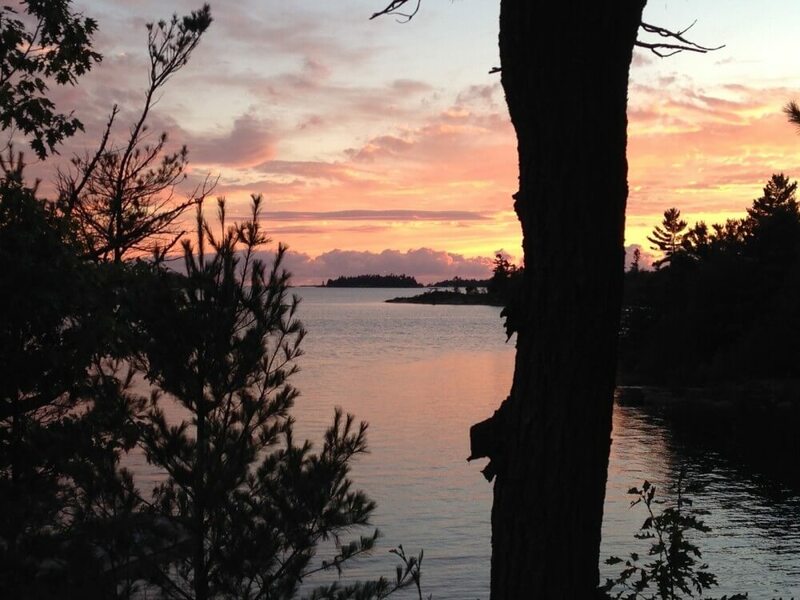 Anyone who has experienced a Georgian Bay sunset knows what it’s like to share a profound connection with those pristine waters, towering trees, and beautiful coastal shorelines. But Georgian Bay is so much more than that. 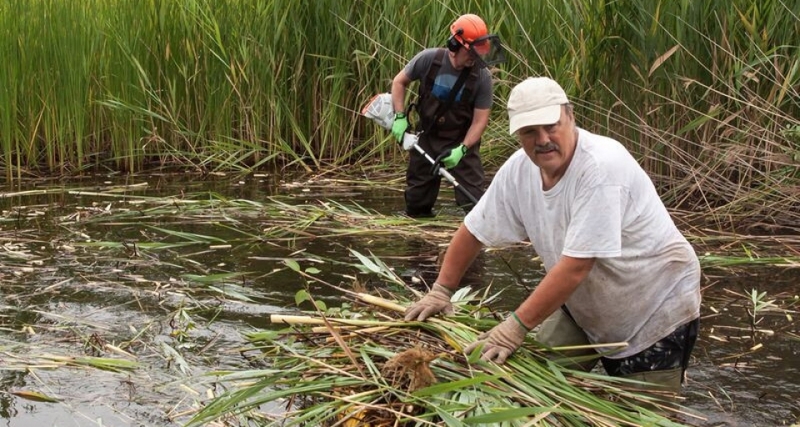 Our coastal wetlands are home to 80 per cent of the Great Lakes’ 3,500 species and are considered to be among the most productive and diverse ecosystems in the world. 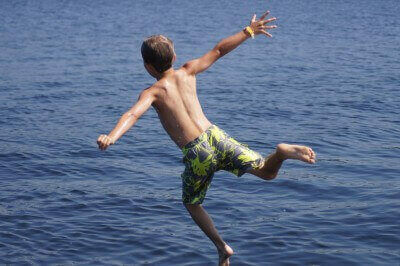 As people who live, work or play on the Bay, we have all been entrusted with its care. Growing threats from climate change, pollution, and invasive species, however, are placing our waters at risk. Learn more about GBF’s scientific work on water levels, water quality and ecosystems and how it is making a difference in the long-term viability of Georgian Bay. Preserving and protecting these essential waters is at the heart of what we do at Georgian Bay Forever, so that they remain healthy, safe and secure for generations to come. Solely supported through the generosity of our donors, our small, but influential organization has drawn international attention for our work and plays a key role in informing important environmental policy in Canada and the United States through accredited scientific research projects and public education. Want to help GBF’s efforts to protect Georgian Bay’s waters? 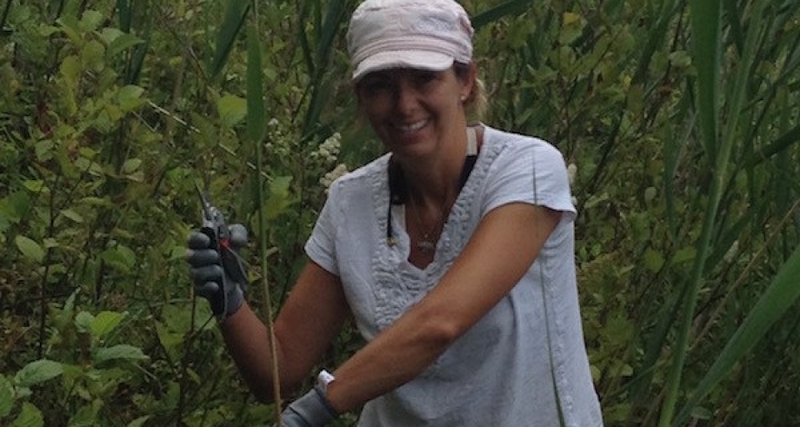 Donate, become a Phragbuster and/or join our emailing list! If we could use one word to sum up GBF’s activities in 2015, it would be “resolve”. We generated new solutions to our pillars of interest on water levels, water quality and ecosystems, expanded our outreach to raise awareness of our activities, and added clarity and focus to guide our work in the years ahead. Significant effort was made this year to ensure GBF’s work truly reflects the entire Bay community. 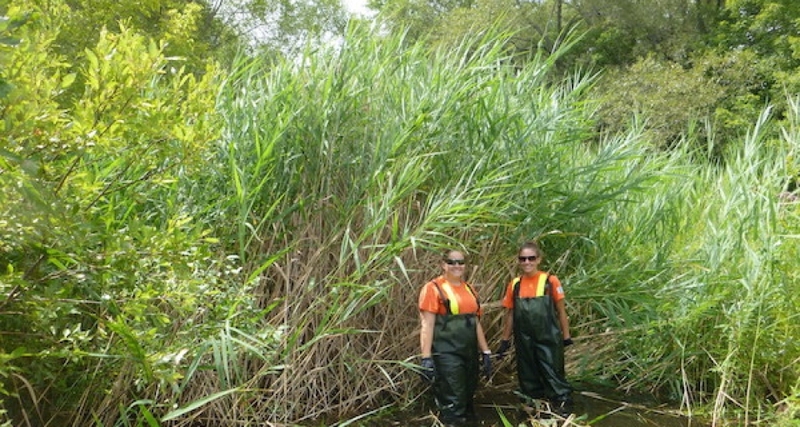 Among the many priority projects we undertook was an engineering study to recommend climate resilient structural options for managing water levels within the Great Lakes-St. Lawrence River System, ongoing work on a standardized water quality protocol to support consistent data collection to help inform water research and government decision-making, and a community mobilization initiative to help eradicate invasive Phragmites which are threatening our precious coastal wetlands. 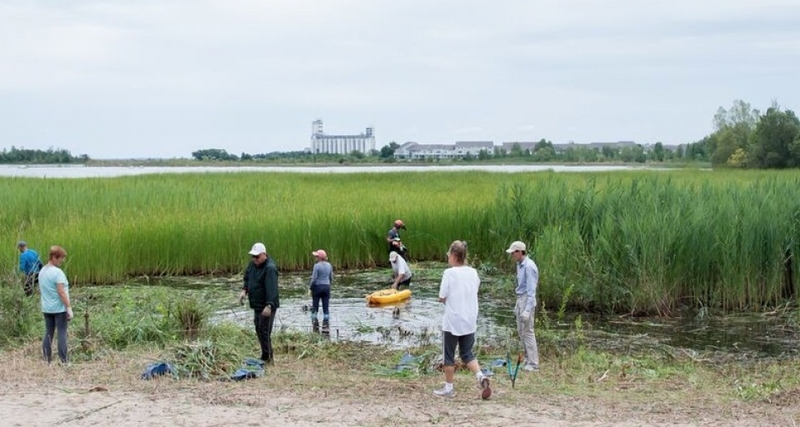 Initiatives like these demonstrate how our investments are truly making a difference in protecting life as we know it on the Bay, and how our work on water levels, water quality and ecosystems is all inter-connected in some way. Working together with our Board, we developed a new strategic plan to help prioritize our work and guide our decision-making over the next three years. We updated our vision and mission statements and identified seven strategic priorities and associated projects to help move our work forward. Among these is a commitment to clarify our role within the GB-5 in response to feedback from stakeholders, and to further build our profile through enhanced communication. We have already taken steps on the latter by adding a full-time communications role to our team, updating our website, and enhancing our social media presence in order to educate as many people as we can about water issues, climate change and threats to Georgian Bay and the Great Lakes. 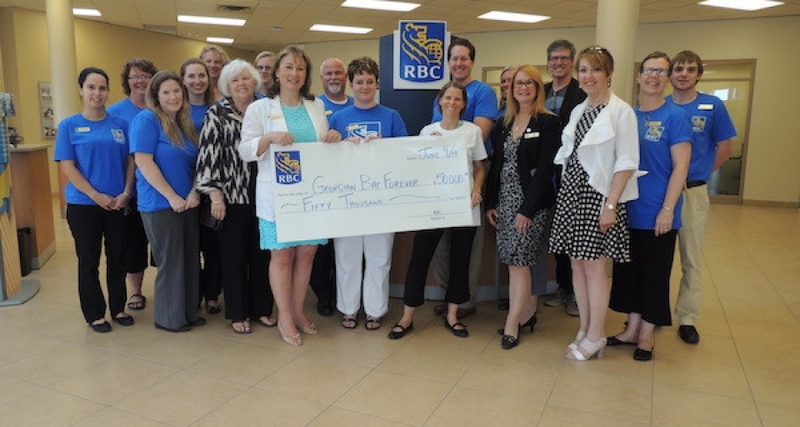 This has further expanded GBF’s outreach and influence as indicated by the 10 per cent increase in new donors who contributed to the close to $500,000 we received in donations this year. GBF ended 2015 with a modest financial deficit. 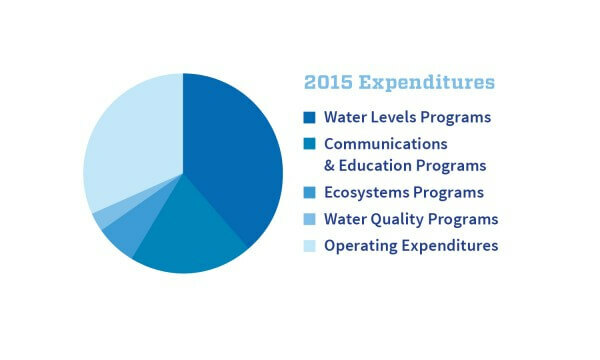 This was a carefully planned shortfall that allowed us to invest in The Search for New Solutions study on water level management, and to expand communications and education. These are responsible investments that will result in long-term benefits for the Bay and lay a strong foundation for our work in 2016 and beyond. 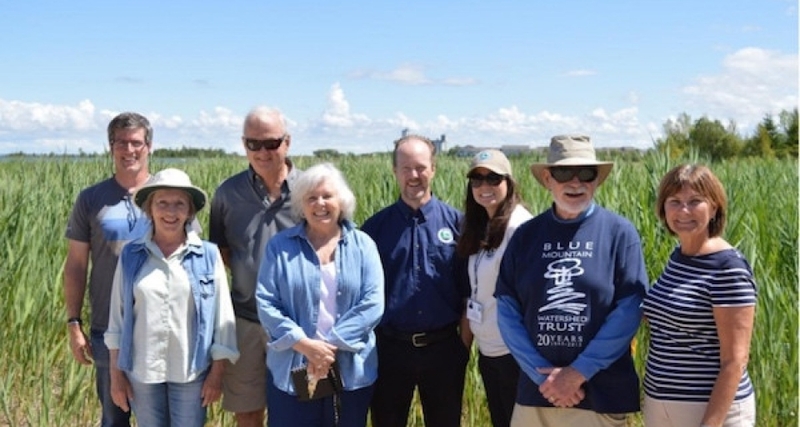 Our work would not be possible without the support of our many partners, donors, and community volunteers who share our passion for keeping the Bay’s waters and ecosystems healthy and thriving. A special shout out to our colleagues at the Georgian Bay Association on their milestone 100th Anniversary! 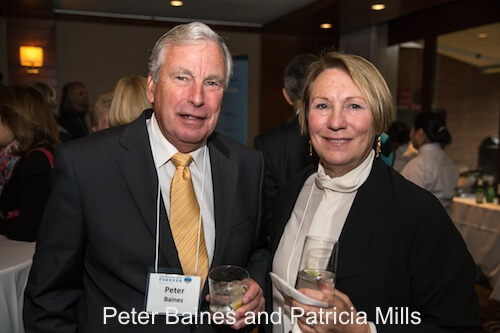 We also wish to extend our heartfelt thanks to former board chair, Brenda Drinkwalter, who worked tirelessly during her two-year term to advance our mandate and raise GBF’s profile, and retiring board member Hugh McLelland, who served on the GBF board for many years. Check out GBF’s latest communication tools to help keep you informed about new and ongoing scientific projects and educational activities. Who does what on the Bay? As we move forward with some exciting new projects in 2016, we hope you will join us and support us in the year ahead to protect Georgian Bay’s precious waters. Meet the men and women who so generously volunteered their time in 2015 to help GBF advance our mission. 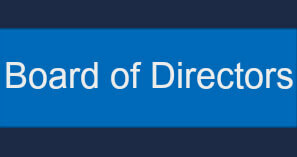 Find out about the committees on which they served. 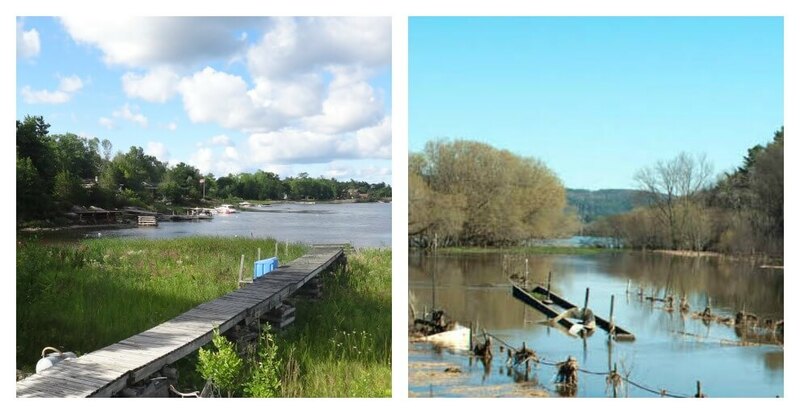 While water levels are slightly higher than long-term average levels once again, it’s important to remember the devastating impact of the low water levels we experienced in 2012/13. We know from the International Joint Commission’s International Upper Great Lakes Study, that climate change will continue to make our lakes vulnerable to fluctuating water levels in years to come, and from the GBF and and Council of the Great Lakes Region funded Mowat Centre study, Low Water Blues , that this will have serious economic and ecological repercussions for the Great Lakes over the long-term. Building on this important work, GBF identified the need to develop structural solutions to mitigate water level extremes – higher highs and lower lows. We retained AECOM, a highly respected global engineering firm, to explore, assess and recommend contemporary, climate resilient structural options for managing the water levels of Lake Michigan-Huron and Georgian Bay. Managing Water Levels in the Great Lakes: The Search for New Solutions was one of GBF’s most significant and high impact investments this year. With the firm’s final report set to be released in 2016, we will be sharing the results with Canadian and U.S. decision-makers and opinion leaders who have the ability to act on the recommendations. During Phase 2 of our strategic partnership with the NASA DEVELOP Program at the Langley Research Center in Virginia and the Great Lakes St. Lawrence River Cities Initiative, we used satellite imagery captured between the high levels in May 1987 and the low levels in June 2013 to measure the impact of varying water levels on wetlands. 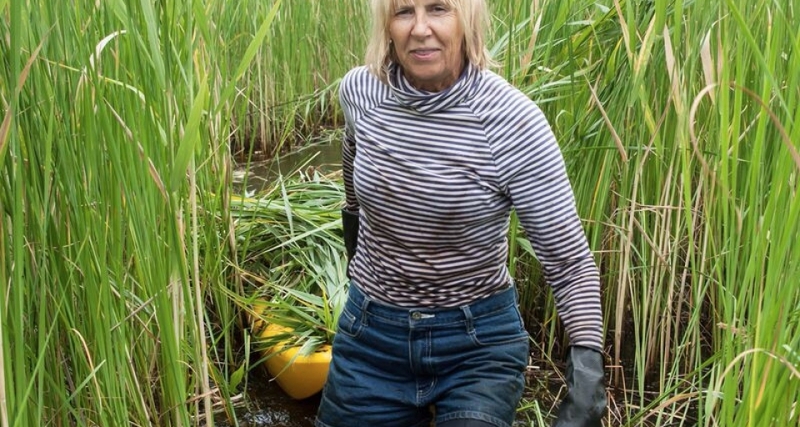 Results indicate a net loss of 3.8 per cent to the Bay’s coastal wetlands, with a 7 per cent wetland gain in the North and a 10.8 per cent wetland loss in the South. 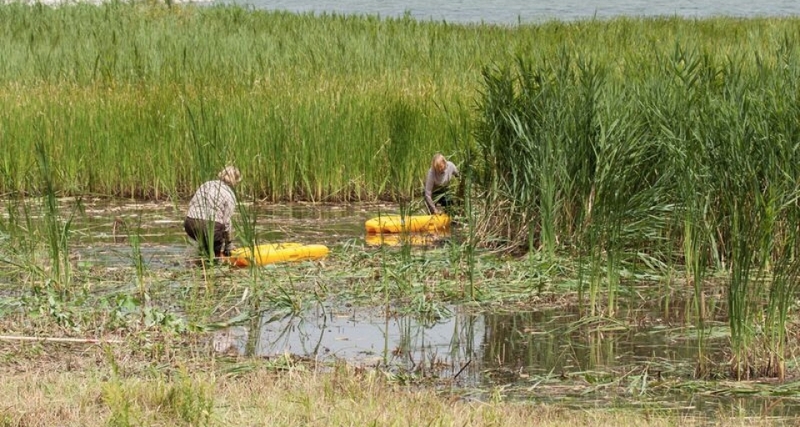 As outlined in this GBF-guided study, changing water levels can have serious consequences for water quality, fish communities, native waterfowl and wildlife, and tourism, all of which depend on healthy and thriving wetlands to survive. In 2016, we will explore how we can transfer the methods used in this project to other areas around the Great Lakes. Based on our discussions with key stakeholders, water quality remains a top priority for those who live, work and play on the Bay. Building on our water quality monitoring work with the Township of Georgian Bay, GBF continued its two-year partnership project with the Georgian Bay Biosphere Reserve and other key partners to harmonize water-testing protocols across the Bay. 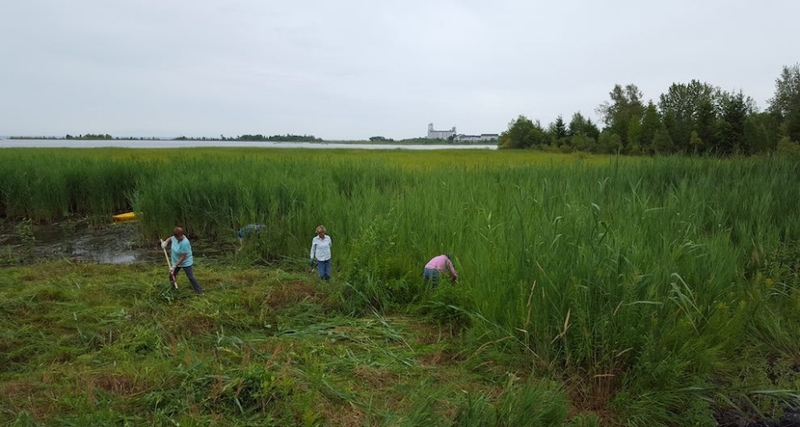 This work will help us to provide Township and cottage association volunteers with standardized tools to track water quality data in a similar and comparative manner to better inform water quality research and government decision-making. These tools will replace the more than 15 different water quality-monitoring programs currently in use on the Bay, which make scientific comparisons between regions challenging. 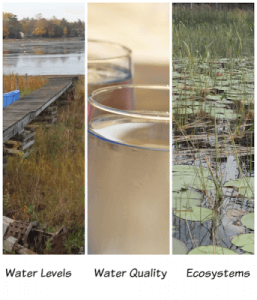 A standardized water testing protocol will also allow us to compare our findings with other coastal monitoring programs through the Ontario Ministry of the Environment and Climate Change’s Lake Partner Program. This work is set to be completed in 2017. 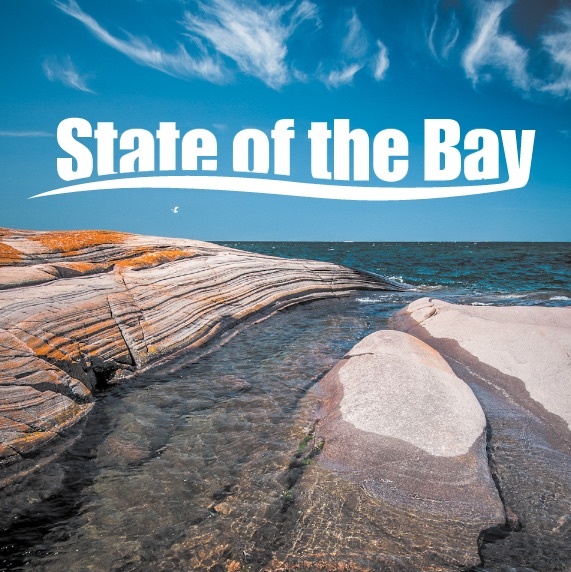 The results will be highlighted in the next State of the Bay report for Eastern and Northern Georgian Bay, slated for publication in 2018. 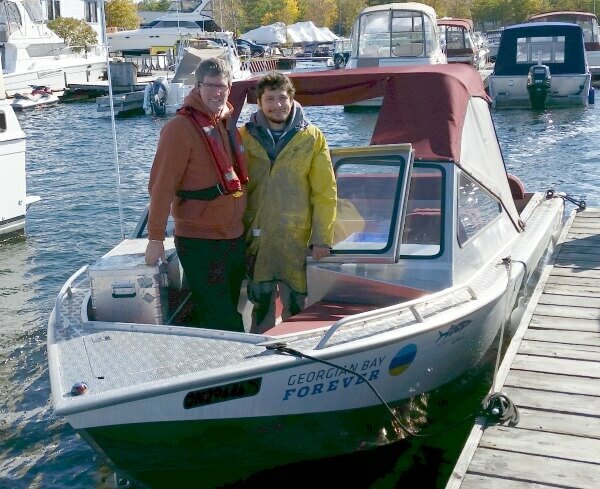 Thanks to the generosity of GBF donors who supported the purchase of our 19’ boat, the Baykeeper, we are able to assist the work of researchers who wouldn’t otherwise have access to the resources they need to complete their work. 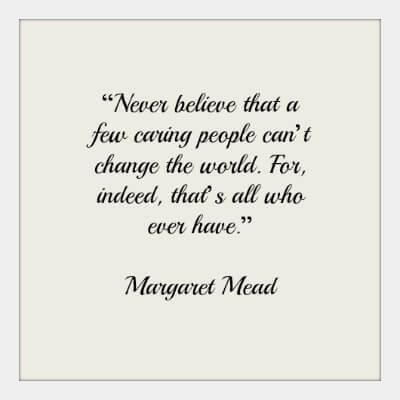 Learn more about donating. The completion of a three-year Water Quality Program redesign in the Township of Georgian Bay marked GBF’s first use of microbial source tracking, a novel diagnostic tool used to help identify whether the source of microbial contaminants (e.g., bacteria, parasites, viruses) in our waters are human or animal. The final report , released in 2016, shows that contaminant levels in the Township’s water from birds, humans and pets are well below the water quality standard limits for Ontario, which should give the population confidence that the systems the Township currently has in place are working well. GBF is always pleased when we can support the research of others like University of Toronto Professor Maria Dittrich. She and her students were able to collect samples and perform microsensor measurements in Honey Harbour thanks to GBF’s cooperation. 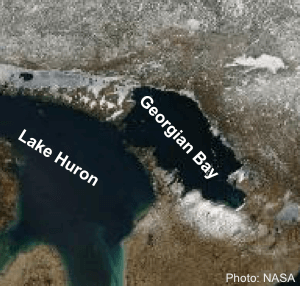 Their study of the make-up of sediment in Honey Harbour and its capacity to release phosphorous into the water will move us closer to predicting the risk for toxic algae blooms in south-eastern Georgian Bay. 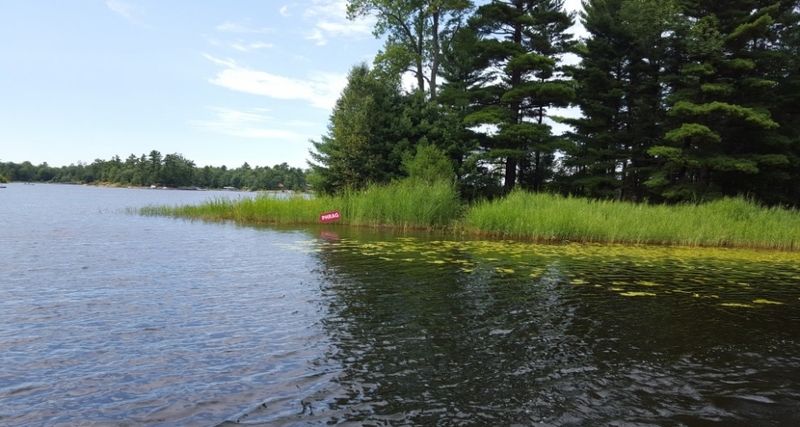 The team used data from GBF’s paleolimnological study to establish baseline conditions for the sediment, and will benefit from data collected during an Environment Canada study conducted at the same time. Results of the studies will be released in 2016 and the team’s final report will be submitted in May 2017. Learn More. Never underestimate the power of community. 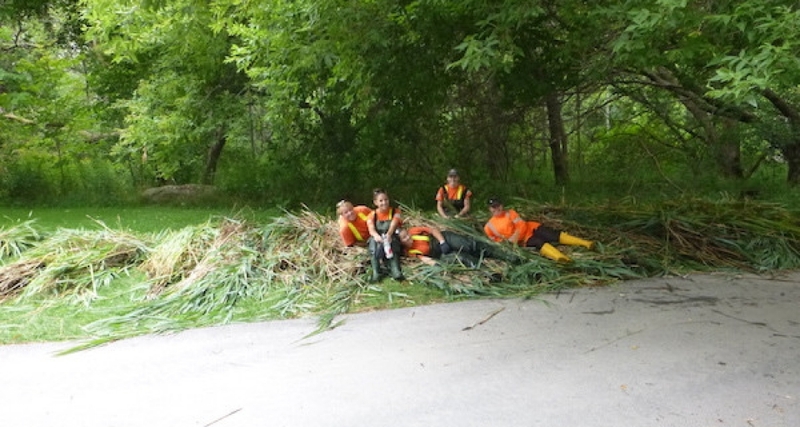 Following 2014’s highly successful pilot project to eradicate invasive Phragmites in Eastern Georgian Bay, GBF expanded its reach in 2015 to 16 communities from Collingwood to the North Channel. 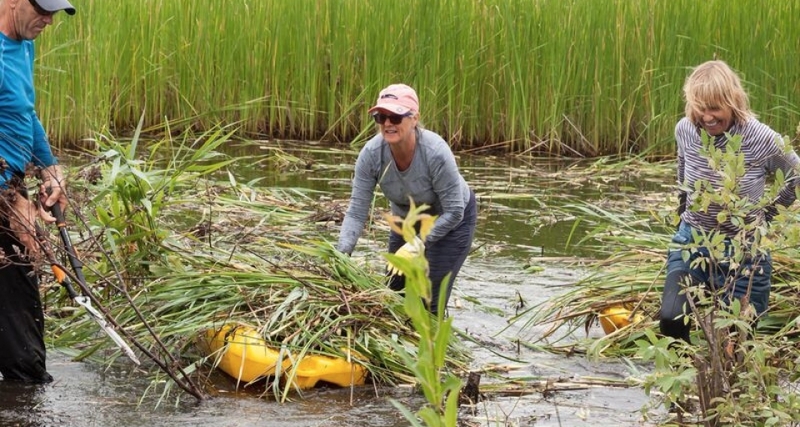 With the help of the Georgian Bay Association, we educated, trained and mobilized teams of volunteer “phragbusters”, helping them to remove more than 8,000 kg of Phragmites and take the first important steps towards eliminating this serious threat to our ecosystems. 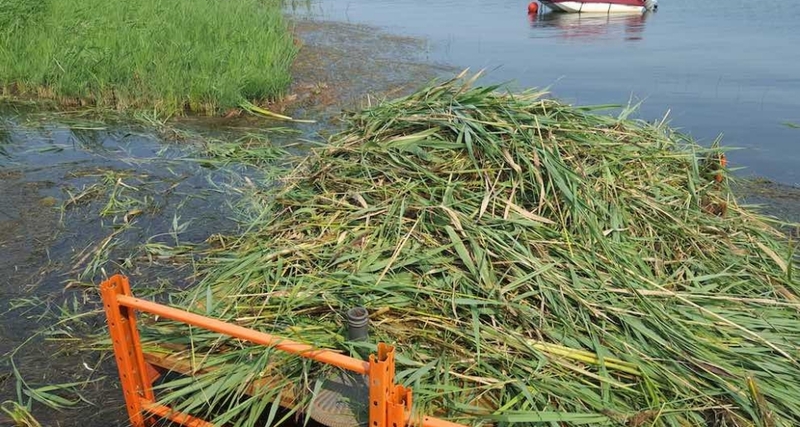 The devastating impact of Phragmites can be seen along more than 8,000 km of shoreline and 3,700 km of aquatic marshes in the southern, eastern and northern portions of the Bay where it is quickly displacing local flora, fauna and fish habitats, and taking over our beaches. 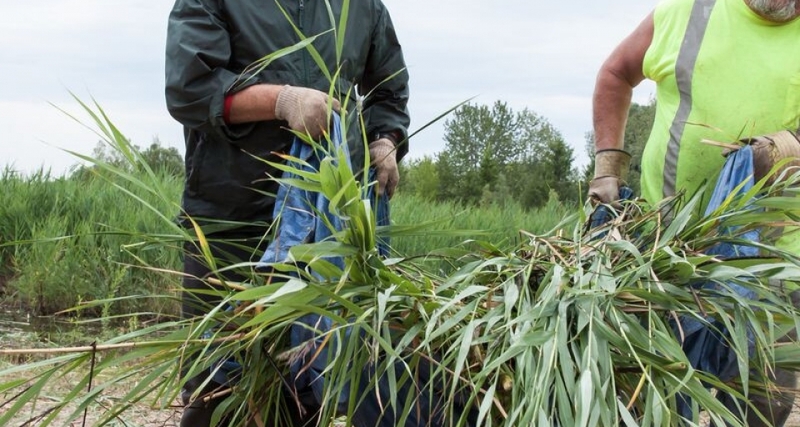 Ongoing community-based action is the only means available to eliminate this invasive species. Equipped with the right knowledge and training, these communities now have the capacity to wipe out this menacing plant over the next four to five years through annual removal of any new growth. Learn more. 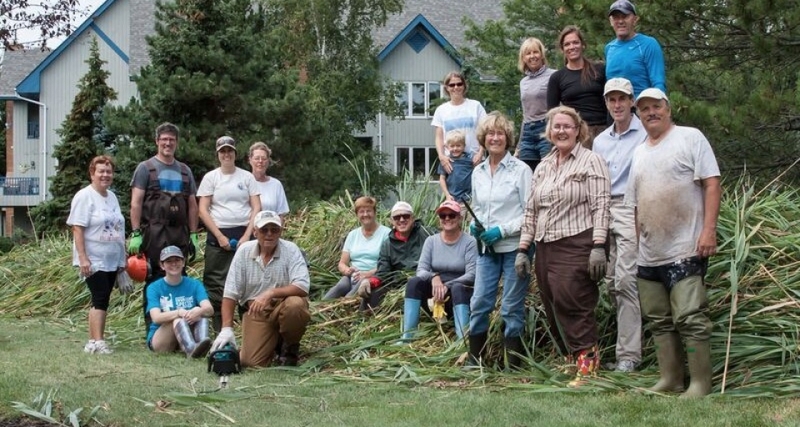 Partners: Georgian Bay Association , Cottage Associations, Community Volunteers, RBC Blue Water Project, Nottawasaga Valley Conservation Authority , Environment Canada . 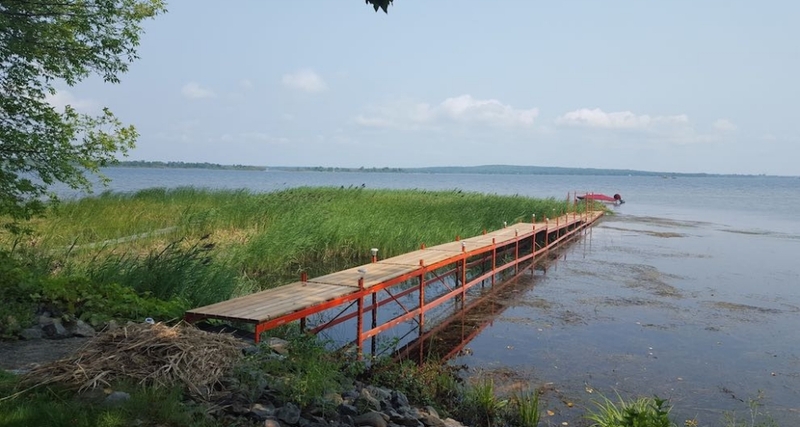 Building on work we started with the University of Guelph in 2012, we continue to take a leadership role in the Great Lakes region to support the development of an aquatic biodiversity library for the Bay. 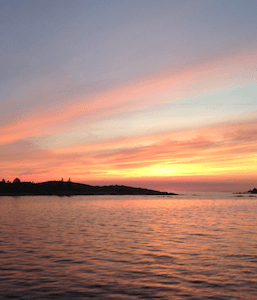 Using sophisticated Canadian-developed DNA bar coding, GBF is collecting samples to rapidly and cost-effectively identify all living organisms and species living in the Bay. This work will allow us to monitor how stressors of the ecosystem impact diversity and the food web over time and will aid in identifying hot spots in need of protection. A progress report on the status of this project will be released in 2016 with a focus on the impact of open cage aquaculture on water quality and the food web. 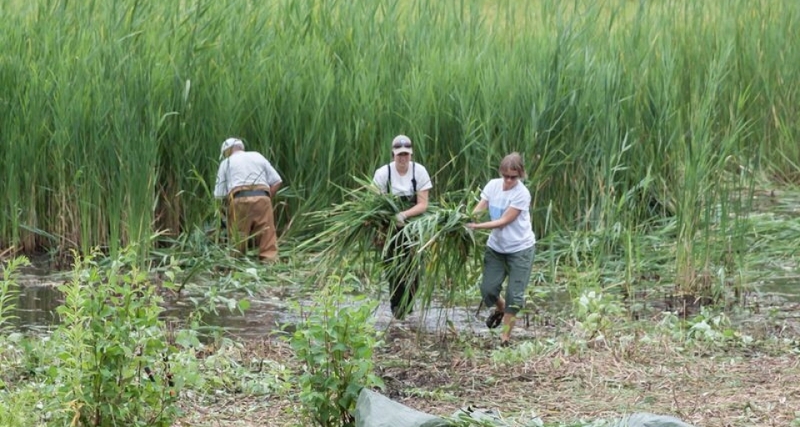 Seeking new habitats for the survival of declining fish species. 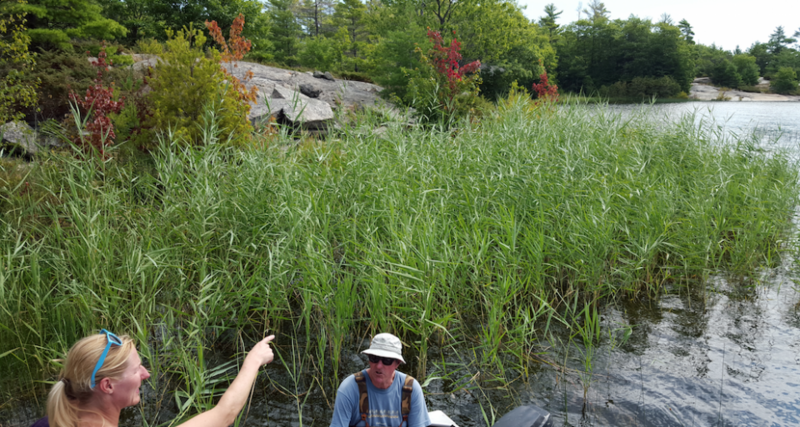 With Walleye, Lake Sturgeon and Sucker species on the decline in certain areas of Eastern Georgian Bay, GBF is partnering with the Eastern Georgian Bay Stewardship Council on their 32-month project to survey 8 to 10 tributaries within the Parry Sound District. Using lakebed mapping, aerial and underwater photography, water flow and other measurements, we are assessing the suitability of these tributaries for restorative work to enhance spawning, rearing, nursery and foraging habitats for these species. 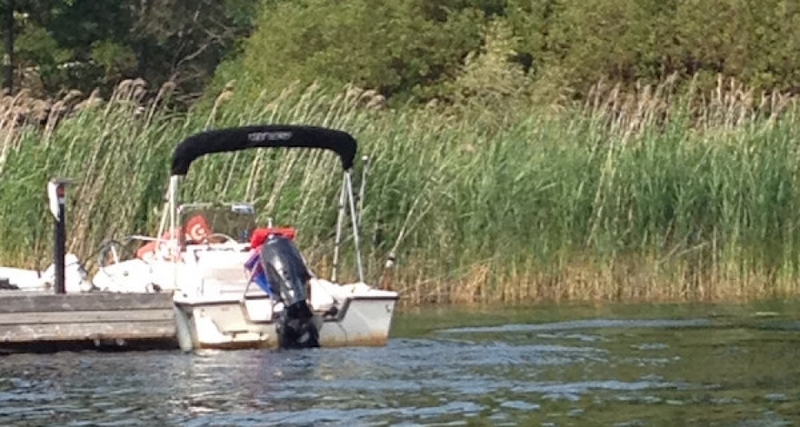 GBF is supporting this initiative through fieldwork involving our staff, boat and sounding equipment. 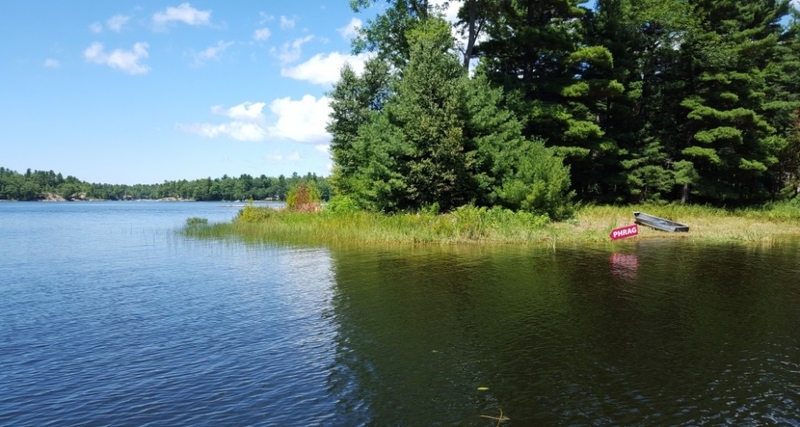 In 2015, we began work on the Blackstone, Seguin, Shebeshekong and Shawananga Rivers, with plans to expand and include the Magnetawan, Key, Pickerel and French Rivers, Sucker’s Creek and potentially the Naiscoot River by 2018. The Georgian Bay Forever Circle was officially launched in the spring of 2015 and recognizes, in perpetuity, donors who have reached a lifetime giving level of $15,000 or more. 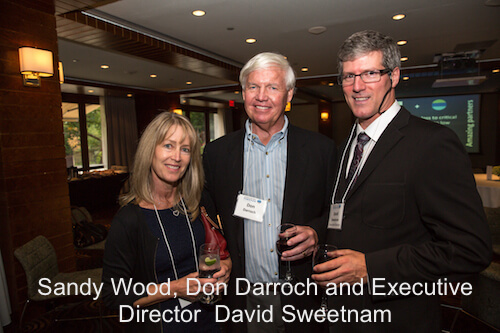 As part of the launch of this new recognition program, Georgian Bay Forever hosted an appreciation event for our generous donors in October 2015. It was a wonderful opportunity to thank our extraordinary donors for sharing our quest to ensure that Georgian Bay remains drinkable, swimmable and fishable for generations to come. 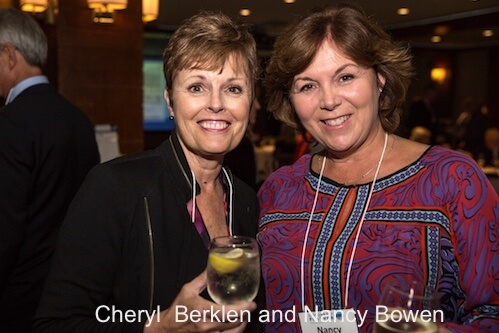 To find out more about becoming a member of the Georgian Bay Forever Circle or, if you are interested in making an additional gift, please contact David Sweetnam, Executive Director, at 905-880-4945 ext. 1. GBF is pleased to recognize the members of the Georgian Bay Forever Circle for their total lifetime contributions. Great Lakes Basin Conservancy, Inc.
Georgian Bay Forever is grateful to all of our donors and sponsors who make all that we do to protect the waters of Georgian Bay possible. More than 80 per cent of your contributions go directly to one of our many research and education projects that are aimed at informing water levels management, maintaining water quality, and protecting the ecosystems of Georgian Bay. 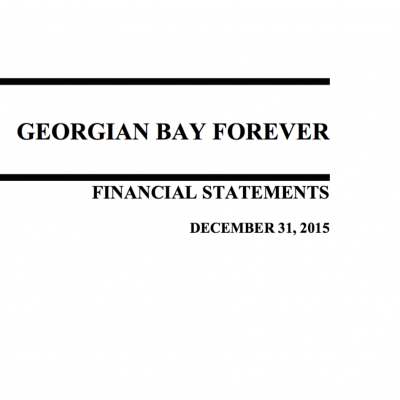 We deeply appreciate everyone who donated to Georgian Bay Forever in 2015. Memories-are-forever gifts: Individuals listed below have had gifts made in their honour. 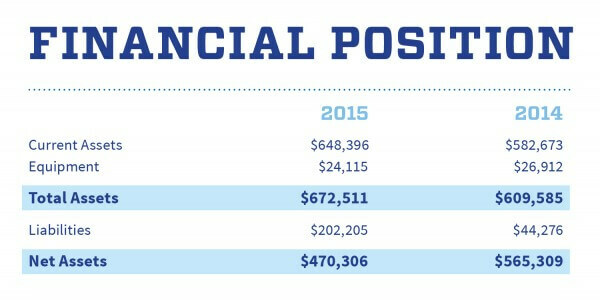 A 10 per cent increase in new donors who, in addition to current donors, contributed to nearly $500,000 in donations in 2015. GBF ended 2015 with a carefully planned modest financial deficit; allowing for investments in the engineering options study and to further expand communications and education. 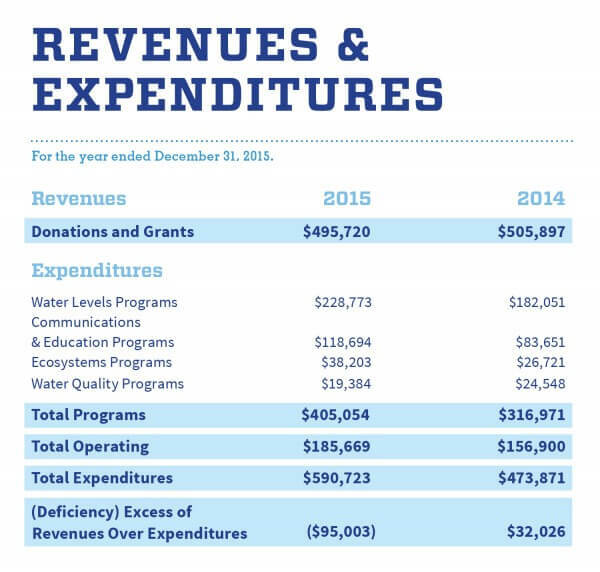 2015 builds a strong foundation for our work in 2016 and beyond.